Hives is a common allergic skin reaction. It can be caused by something a person has eaten, touched, or been near. Hives cannot be spread to other people. They will normally go away on their own. Hives often come and go for a few days to a week. Sometimes they can come back weeks or months later. Some people have chronic hives. This means that their hives come and go for years. Localized Hives: localized hives occur on just one area of the body. This type of hives can be caused by touching plants, pollens, pet saliva, food, chemicals. Some people get hives from firmly stroking the skin. Localized hives is not caused by drugs, infection, or swallowed foods. They most often go away in less than 4 hours. Widespread Hives: widespread hives are hives that occur on more than one part of the body at the same time. It is an allergic reaction to something. It can caused by things like food, medicines, or an insect bite. Sometimes people get widespread hives after a viral infection. Stress can sometimes bring on hives or make them worse. Often the cause of hives is never found. Hives can occur with different types of allergic reactions. Hives can sometimes be the first sign of a severe allergic reaction. Localized Hives: these are hives that occur on one part of the body only. Widespread Hives: these are hives that occur on 2 or more parts of the body. Severe Allergic Reaction: there will be other symptoms besides just hives. These include fainting, a swollen tongue, shortness of breath, or stomach pain. This is a medical emergency. Anaphylaxis: this is the term for a very serious allergic reaction. A person can die from this type of allergic reaction. It happens very quickly, usually within minutes after an exposure. Symptoms include shortness of breath, wheezing, and severe weakness. The throat can swell shut, blocking normal breathing. This is a medical emergency and an ambulance should be called right away. Food can cause hives, mostly near the mouth. Sometimes, they may mean that you have a mild food allergy. Some people can get them from eating some common foods like strawberries. Hives from foods most often go away within 6 hours. You can take one of the following drugs for hives and itching: diphenhydramine (Benadryl), cetirizine (Zyrtec, Reactine), or loratadine (Claritin, Alavert). Prevention: Avoid any food that you think caused the hives. Hives is a common allergic skin reaction. Localized hives occur on just one area of the body. 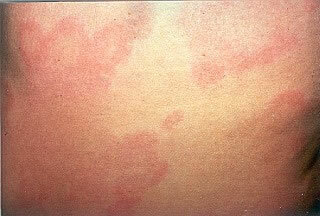 This type of hives can be caused by touching something to which you are allergic. It can be an allergy to a plant, pollen, pet saliva, food, or a chemical. You can treat hives at home. Wash the allergens off the skin with soap and water. If your skin is itchy, massage it with a cold washcloth or ice. The hives most often go away in a few hours. You will most likely not need to take an antihistamine. You can use hydrocortisone for very itchy spots. Put 1% hydrocortisone cream on the itchy area(s) 3 times a day. Use it for a couple days, until it feels better. This will help decrease the itching. This is an over-the-counter (OTC) drug. You can buy it at the drugstore. Some people like to keep the cream in the refrigerator. It feels even better if the cream is used when it is cold. Caution: do not use hydrocortisone cream for more than 1 week without talking to your doctor. Prevention: Try to avoid what you think caused the hives. Widespread hives are hives that occur on more than one part of the body at the same time. It is often an allergic reaction to something that you have been exposed to. It can caused by things like food, medicines, or an insect bite. Sometimes people get widespread hives after a viral infection. Stress can sometimes bring on hives or make them worse. Often the cause of hives is never found. Remove allergens by taking a bath or shower. This is important if the hives were from pollens or an animal. You should also change your clothes. Take a cool bath for 10 minutes to help the itching. Rub very itchy skin with an ice cube for 10 minutes. It is normal for hives to come and go for 3-4 days. Then they will go away. You can take one of the following drugs for hives and itching: diphenhydramine (Benadryl), cetirizine (Zyrtec), or loratadine (Claritin, Alavert). Hives are not contagious. You cannot spread hives to other people. You can return to work or school if the hives do not interfere with normal activities. Prevention: If you identify a substance that causes hives, try to avoid that substance in the future. The shapes of hives vary. Sizes of hives vary from ½ inch to several inches across. 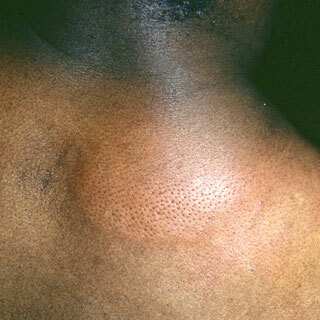 This photo shows a large hive (welt or wheal) on the back of a person with dark skin. Hives is an itchy, raised rash.